Michael J. 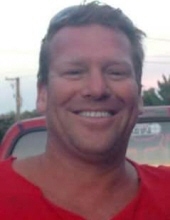 "Mike" Fox, age 48, a brief resident of Sunrise Beach, MO, formerly of West Chicago and Warrenville, IL, passed away unexpectedly on Saturday, January 19, 2019. He was born on May 2, 1970 in Naperville, IL. Beloved father of Michael J. Fox of Batavia, IL and Jordan Supena of Georgia, loving son of Sally (Ralph, Sr.) Schmuggerow (nee Atkinson) of Warrenville, IL and the late Lawrence "Larry" Fox, adored brother of Debra "Debbie" (Todd) Saylor of Warrenville, loving uncle of Troy and Trent Saylor, dear nephew of Sandy (Jim) Pippenger, Sherry (Joe) Colson, Ed Atkinson, Stevie (Ken) Beatty, Jerry (Nikki) Atkinson, Ray (Heidi) Atkinson and the late Denny Atkinson and the late Randy Atkinson, great-nephew of Tom (Marilyn) Fox, fond cousin and friend of many. Mike attended West Chicago High School and Wheaton Central High School. A carpenter by trade, he was a proud member of Laborers' International Union Local #582. Mike enjoyed the outdoors, especially fishing and operating off-road vehicles. Visitation Monday, January 28, 2019, 4:00-8:00 PM at Friedrich-Jones Funeral Home & Cremation Services, 44 S. Mill St., Naperville, IL. A celebration of Mike's life will be held Tuesday, January 29, 10:30 AM in the funeral home. Interment: Warrenville Cemetery, Warrenville, IL. To send flowers or a remembrance gift to the family of Michael J. "Mike" Fox, please visit our Tribute Store. "Email Address" would like to share the life celebration of Michael J. "Mike" Fox. Click on the "link" to go to share a favorite memory or leave a condolence message for the family.